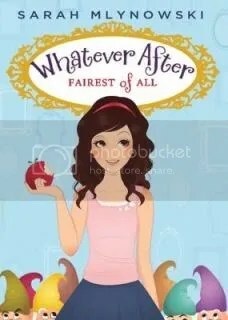 Posted on June 12, 2012	by Katy K.
Whatever After: Fairest of All by Sarah Mlynowski. In this light modern fantasy, practical Abby and her trouble-prone younger brother (ages 10 and 7, respectively) move to a new town. In the spooky basement of their new house, they find a large mirror, which turns out to be magic. In fact, it takes them (Abby most reluctantly) right to the middle of the tale of Snow White. Younger brother, a bit quicker thinking than Abby, recognizes this immediately – the wicked stepmother is trying to give Snow White the apple. At first they congratulate themselves on having saved Snow’s life, but then they realize that they’ve also deprived her of her happy ending. On the other hand, does Snow really want the happy ending the storybooks have assigned her? This is clearly the beginning of a series, not necessarily deeply thoughtful but without any painful clunkiness. I’d recommend it mostly to girls of the target middle grade age. Except that Elaine_Alina should read it, maybe to her daughter. Because really, how often does the heroine win the day by studying property law? This entry was posted in Books, Uncategorized and tagged fairy tales, youth fantasy. Bookmark the permalink.